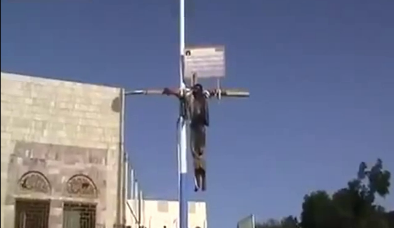 Why Is The Media Silent About The Crucifixion Of Christians By Radical Jihadists? Could you imagine the uproar in the mainstream media that we would see if a member of a politically favored class of people was crucified for who or what they are? There would be front page headlines for weeks. But because members of a politically favored class (Muslims) are doing it to members of a non-politically favored class (Christians), it is not newsworthy at all according to the media. In many instances, Christians are being crucified by jihadists that are actually being assisted and funded by the governments of the United States and Saudi Arabia. Yes, our tax dollars are being used to help arm and supply radical jihadists that are beheading and crucifying Christians. And yet none of the big media organizations considers this to be news. Sister Raghida, former head of a Christian school in Damascus explained the horrific event. “Islam or death” was the choice given to many Christians in Syria on Tuesday during the height of the conflict in Syria. She said many Syrian Christians have been affected by the atrocities taking place in the Christian population of the Middle Eastern country, an area once known for the harmonious coexistence of Muslims and Christians. The boys both refused to renounce faith in Jesus Christ and were martyred because of it. One of them was crucified in front of his father, who was then killed. The nun went on to tell the radio station that the Jihadists entered the city of Maaloula and started killing men, women, and children. According to her report, they killed and played football with the heads of those murdered. Sister Raghida also said the killers took pregnant women and pulled out the babies from their wombs and hung them from a tree by their umbilical cords. This kind of brutality is absolutely unprecedented! Who has ever heard of such a thing being done to pregnant women and children? You would think that crimes of this magnitude would be front page news all over the globe. But instead, there is mostly just silence. About the only mainstream news outlet in the U.S. that will even touch this stuff is Fox News. And even they don’t give it front page treatment. Usually you have to really dig to find a brief story about the slaughter of Christians that we are seeing all over the planet. Al Qaeda-backed jihadists are hanging the bodies of executed enemies on crosses crucifixion-style in a town in Northern Syria, according to a Syrian opposition group. The executions reportedly took place Tuesday in Raqqa, where the extremist group Islamic State of Iraq and the Levant, or ISIS, an Al Qaeda-linked network, has taken over the city, according to Abu Ibrahim Alrquaoui, who identifies himself as a founder of a group called Raqqa is Being Slaughtered Silently. As I mentioned above, the jihadists that are doing this have the support of Saudi Arabia and the United States. The Obama administration and the Saudia are desperate to overthrow the Syrian government, and Obama seems to have no problem allying us with some of the most despicable jihadists on the entire planet in order to make that happen. For a major part of the past year, it was occupied by Islamist Syrian rebels associated with al-Qaida who took advantage of its commanding position over Maaloula to help keep their grip on this Christian village. During the occupation of the village by the Saudi- and U.S.-supported rebels, strict Shariah law was enforced. Those Christians not able to flee were treated as slaves. Several Christian men were beheaded, and many of the women were forced into “temporary” marriages with multiple Islamic fighters. While many of us were enjoying our Friday evenings, a massacre was taking place in Nigeria that left between 100 and 150 Christians dead and around 200 homes burned to the ground. At around 10pm Nigeria time last night while villagers were asleep, more than 40 Fulani herdsmen attacked the Ungwan Gata, Me-Sankwai and Tekum villages in Manchok (Kaura Local Government), which is located in Southern Kaduna, Nigeria. Southern Kaduna is a predominantly Christian. These jihadi attackers first set fire to homes and when the Christians attempted to escape their homes, they were shot dead or butchered with machetes. The ones who could not escape their homes burned to death. No one attacked was spared, including women and children. A pastor, his wife, and their children, of one of the villages, were said to be among the butchered. Have you heard about that incident before now? You see, the truth is that the elite control the “matrix” known as the mainstream media, and they don’t consider such stories to be important. Eyewitnesses have given a harrowing account of the murder in Cairo of a young Coptic Christian woman, hauled out of her car and beaten and stabbed to death by a Muslim mob, apparently targeted because of a cross hanging from her rear-view mirror. This is evil to the highest degree. But even in the midst of the slowest news year in ages, the mainstream media still won’t touch this stuff. There is an extreme hesitance in the western world to report anything that will put Muslims in a bad light or put Christians in a good light. Meanwhile, as Christians are being slaughtered by Muslims all over the globe, the western world is doing all that it can to shut down criticism of Islam. Political party leader Paul Weston was arrested by police and faces up to two years in jail for criticizing the religion of Islam during a public speech in the United Kingdom. Weston’s “racially aggravated” hate crime consisted of him quoting Winston Churchill. Weston’s arrest reveals the chilling implementation of thought crime in Britain and how political correctness is being used as a weapon with which to destroy the edifice of freedom of speech across the western world. New York City is moving to close school for two Muslim holidays and the Lunar New Year — but Mayor de Blasio isn’t so sure about the Hindu festival Diwali. Appearing on WNYC’s “Brian Lehrer Show” on Monday, the mayor said he hadn’t taken a position on whether Diwali, the festival of lights celebrated in India and other South Asian countries, should be a day off from school. But he said he’d move forward with closing schools for Lunar New Year and for Eid al-Fitr and Eid al-Adha, Muslim holy days. The principal at Rocky Mountain High School in Fort Collins, Colorado, is facing a hailstorm of criticism from some very angry parents and residents. In the U.S., people are bending over backwards to make the Muslim minority feel more comfortable. But in Muslim countries, Christians are being beaten to death, beheaded and crucified and very few people in the western world even want to talk about it. Has our society become so “politically correct” that we cannot even denounce great evil when it is happening right in front of our eyes? Michael Snyder is the Editor of End of the American Dream.